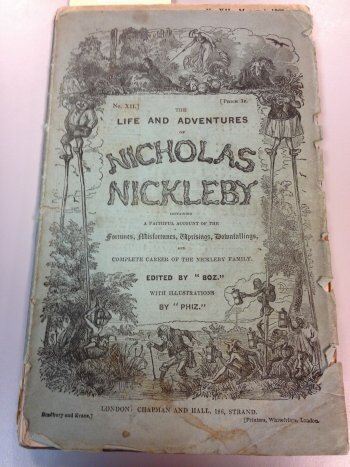 The rare booklet before you was once part of a monthly installment of The Life and Adventures of Nicholas Nickleby, published in 1839. 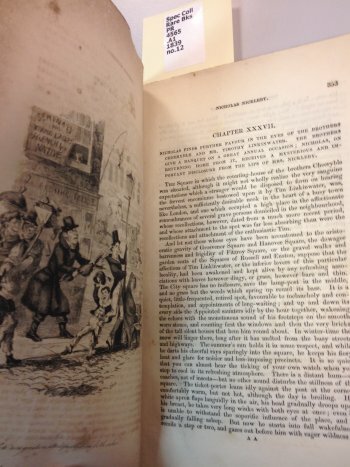 It was written by Charles Dickens under the pseudonym “Boz” and describes a poor, young man and his adventures as he tries to make his way in the world while providing for his mother and sister. Much of the story within this book’s tattered pages comes directly from Dickens’s own life experiences. With seven siblings, Dickens’s was forced to leave school twice during his childhood and teenage years because of financial troubles within his family. His experiences in the workforce greatly impacted the content of his writings, especially his experience as a worker in a boot-blacking factory at age 12. While publishing a novel in parts might seem a bit unusual by today’s standards, it wasn’t unheard of in Dickens’s time. 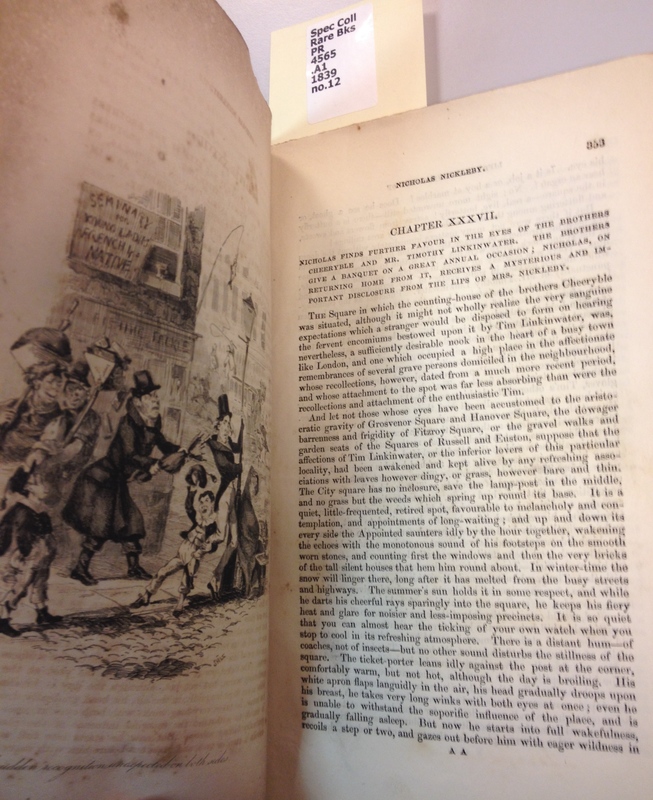 It was Dickens himself who made this publication style popular. Dickens tried his hand at publishing weekly for some time, but returned to parts publication because installments such as this one brought him significantly more success. Signs of the booklet’s age are evident through the decaying binding, the torn, frayed page edges, and the thin, delicate, and browning pages. However, the adventurous tale within is sure to make up for the book’s outwardly dull and aged appearance. The story is preceded by multiple pages of “The Nickleby Advertiser,” which includes ads for waterproof dresses, tailors, shoemakers, and even cures for things such as baldness or toothaches. Some ads are also dedicated to other well-known writers at the time, which were meant to encourage readers to go buy the novels. Within the story, there are also many detailed black and white illustrations, breaking up the small and wordy print that was the style at the time and depicting the story’s lively scenes.